Back in 1988 I left Origin Systems to co-found a new game company named Inside Out Software. Our first projects were ports and we slowly started getting into original games. 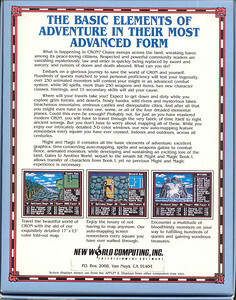 Might & Magic II was our first port (IBM, C64, Amiga). 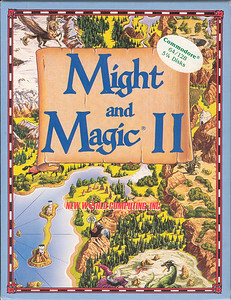 I worked on the port of Might & Magic II from the Apple II (128K, 16-color double-res) to the Commodore 64 (64K, 4-color mixed-mode). It was a pretty interesting experience and I learned a lot from it. The full story is on ROME.RO. Here's the cover of the C64 box. I loved the box with the cover slipping down over the bottom like board games. The mighty title screen complete with minimal animations! The credits screen with a David Hammond listed at the top. As you may find with almost all team credit screens they are very political. I actually did almost all the work on this game but was moved to Tower Toppler to begin that port and have David clean up the rest of the C64 port I had done. I left before the end of the port and they put his name above mine. Nice, but typical. See Gauntlet:Seven Sorrows credits for a rerun of this horseshit. Here's what the game looked like on C64. You'll notice the dotted red line in the middle there - that actually wasn't visible on a real C64 (the screen is from an emulator). I did a pretty cool trick of setting a raster interrupt on that screen row so i could change the video mode to a high-res 2-color mode so the text at the bottom would look crisp(er). Notice the text above the line on the right looks a bit assy - that's because it's in a 160x192 video mode and the text below the red line is in 320x192. I changed the video mode back to 160x192 at the bottom of the screen. Simple menu system from days gone by.